Raspberry Chambord Squares ~ fresh ripe raspberries baked into a buttery shortbread crumble crust and topped with an elegant Chambord glaze! Grease a 9x9 square baking pan. I like to line it with parchment paper with overlapping ends so I can lift it out after it bakes for even cutting. Rinse the raspberries and shake off all the excess water. Toss them gently with the cornstarch, lemon juice and Chambord. Set aside. Cream the soft butter, sugar, and salt until well blended. Add in the vanilla, and then the flour. Blend until the mixture has a crumbly texture, and there is no dry flour remaining. Pat 2/3 of the dough into the bottom of the pan, using your fingers. It doesn't have to be perfect, just make sure to cover all of the bottom of the pan. Spread the raspberries and any juice evenly across the layer of dough. 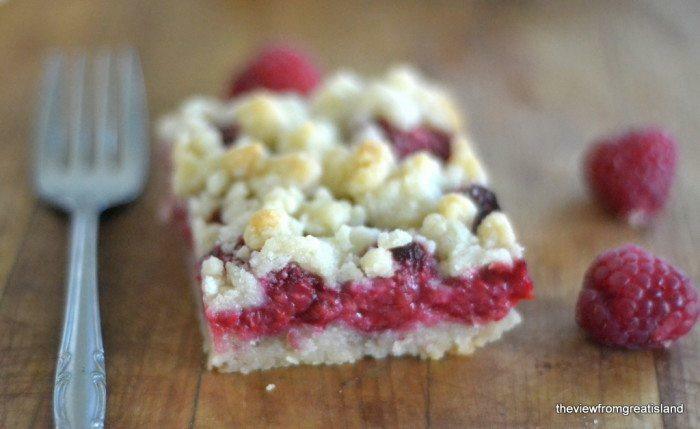 Crumble the remaining dough between your fingers and lay on top of the raspberries. There will be raspberries showing through, that's fine. Bake for about 45 minutes until lightly golden on top. Cool the squares in the pan until firm enough to lift out using the parchment paper as a sling. Finish cooling on a rack.